George Clooney for Valentine’s Day? What could be more romantic for Valentine’s Day than A Night With George? Or two? 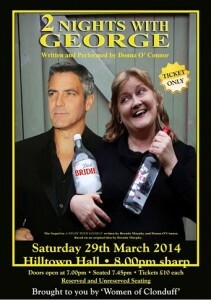 Women of Clonduff are hosting “Two nights with Geroge” next month. And with a free drinks reception hosted by Cavan-based Irish cream liqueur Coole Swan, it will provide the romance of blended Irish whiskey, Belgian white chocolate and Irish dairy cream, guaranteed to melt any heart… Bridie Murphy picks up where she left off with old flame George Clooney in Two Nights With George, sequel to the award-winning comedy A Night With George. There’s something for everyone in this show – laughter, tears, vodka… its a rip-roaring riot from start to finish. 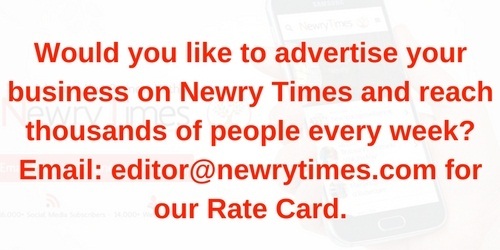 Its on Saturday 29th March at 8.00pm in Hilltown Hall, Rostrevor Road, Hilltown. Tickets are £10 and on sale NOW from Hilltown Post Office. Or call 075 40866986 for ticket reservations. Tickets are limited, so best hurry!